Since his call-up to the Philadelphia Phillies in August 2017, Rhys Hoskins has taken Major League Baseball by storm. A prolific hitter, Rhys burst onto the scene late last summer with a home run barrage that made national news and shattered rookie records along the way. In just 10 months he has become the face of a young and improving Phillies team. Many athletes, when thrust into the limelight, use their newfound celebrity to help their local community or take up a cause near to their hearts. For Rhys, the cause is the Muscular Dystrophy Association. After spending two unforgettable summers as an MDA Summer Camp counselor in Northern California, Rhys knew he wanted to reconnect with MDA once he made it to the big leagues. And he has done just that. In a short period of time Rhys has made a tremendous impact for MDA, participating in local events and befriending several MDA families along the way. On May 12, Rhys will be the emcee of the MDA Muscle Walk of the Greater Philadelphia Area at the Philadelphia Navy Yard. Leading the event and sponsoring a Muscle Walk team is an opportunity Rhys cherishes, continuing his support for an organization that provided him with so many wonderful memories as a teenager. Part of Rhys’ graduation requirement at Jesuit High School in Carmichael, Calif., was to perform 50 hours of community service. When choosing what organization to volunteer for, Rhys relied on word of mouth to aid in his decision. Going into his junior year of high school, Rhys volunteered as a Summer Camp counselor at Sly Park Environmental Education Center, not too far from his home in the Sacramento area. Rhys bonded with his camper, Charlie, and had almost as much fun as the kids themselves. When it was over, he knew it was an experience he wanted to replicate the following year. Rhys has kept in touch with several campers and counselors over the years. Although everyone has gone their separate ways, they are still close. After graduating high school, Rhys went on to play baseball at Sacramento State University before being drafted by the Phillies organization in 2014. Although he was busy establishing himself in the minor leagues, Rhys tried to stay involved with MDA when possible, participating in the ALS Ice Bucket Challenge in 2014 and attending a Harley-Davidson sponsorship event while in Double-A. The Ice Bucket Challenge was an experience that he remembers fondly and made him think about what more he could do to make an impact. Rhys quickly ascended through the minor leagues and received a call-up to the Phillies on Aug. 10, 2017. His impact was both immediate and historical. Rhys became the fastest player to ever hit 17 home runs, accomplishing the feat in just 33 games. The hitting spectacle thrust Rhys into the national spotlight and made him a household name overnight. As he was hitting home runs, Rhys was working behind-the-scenes to re-establish a relationship with MDA. 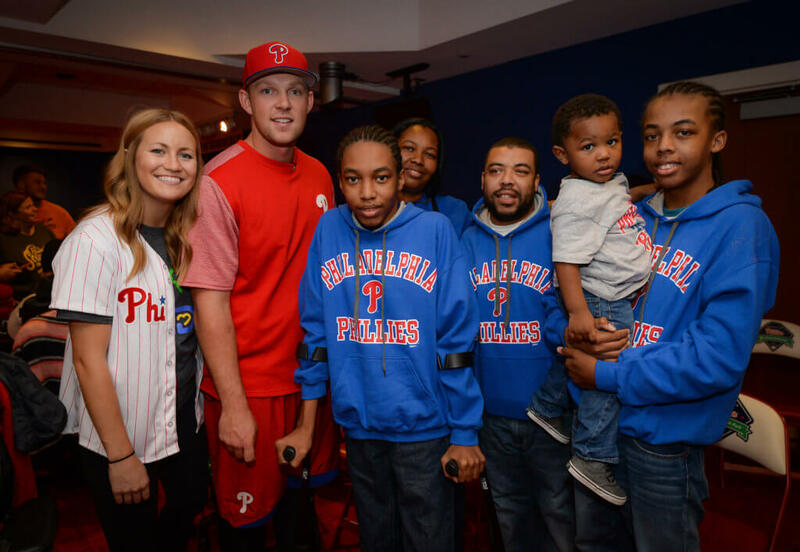 Although a big leaguer for just 10 months, Rhys has already made an impact in the community. On Sept. 30 last year, Rhys hosted an event at Citizens Bank Park, the Phillies’ home ballpark, welcoming more than 100 Summer Camp counselors and kids. In December, Rhys attended a local Muscle Summit, which served also as an unofficial kickoff for this May’s Muscle Walk, where he met families and took pictures. And this April, Rhys teamed up with Collegeville Bakery, a Philadelphia-area restaurant, to sell “Rhys Shakes,” 20-ounce Oreo shakes chosen by Rhys himself. One dollar of every Rhys Shake went to MDA, and those who won an associated campaign raffle had the chance to meet Rhys in person. All of Rhys’s efforts thus far will culminate on May 12, when he hosts the Philadelphia MDA Muscle Walk. In addition to emceeing, he will also be the sponsor of Team Hoskins, composed of family and friends. Amanda is appreciative of all that Rhys has done on behalf of MDA. 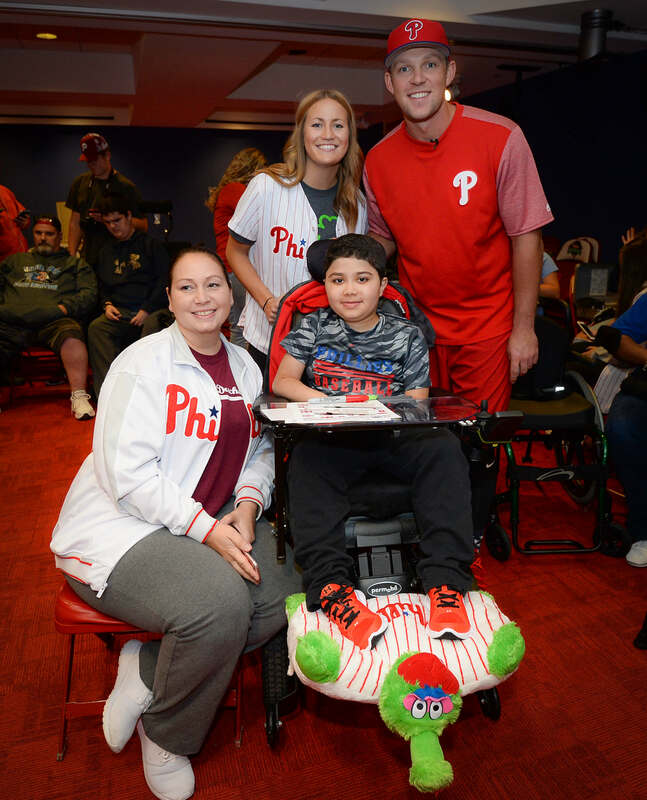 “From the first day that I met Rhys, not long after he was brought up to play with the Phillies, I could tell he was 100 percent dedicated to supporting MDA,” Amanda says. “In a short period of time, I have had the pleasure of watching Rhys interact with numerous MDA families. Each time he gives them his full attention, inquiring about school, sports and everyday life. It is very evident that he is committed to not only helping fund the treatments and cures MDA is searching for but also to getting to personally know the kids and families living with muscle disease in and around Philadelphia. As a longtime supporter of MDA, Rhys appreciates how his visible platform can have an impact for the organization, especially in raising awareness for muscle disease. For anyone interested in volunteering with MDA, Rhys emphasizes the friendships one can make as a major reason to get involved. “What has stuck out for me working for MDA is the relationships I’ve built through the organization,” he says. “The kids are awesome. The families are awesome. The relationships I fostered with some of the counselors and kids when I was at Summer Camp still mean a lot to me.